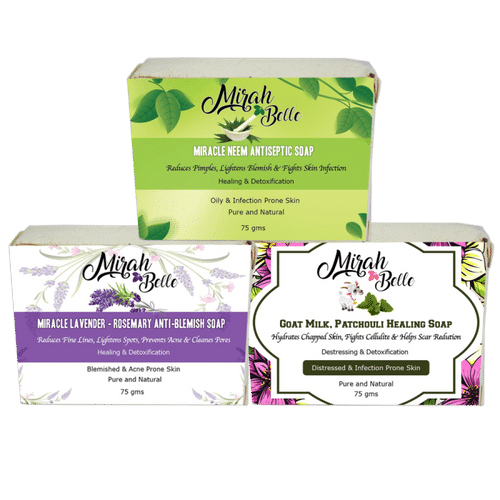 Believe in miracles and heal your skin with Miracle Lavender Rosemary Anti-blemish Soap Blemishes, dark circles and dark spots are some of the things that ruin the beauty to a large extent. You must have tried a number of products available in market for getting rid of these dark spots. But you must keep in mind that these products are filled with synthetic and artificial chemicals which might help you to get rid of these dark spots, but in the long run, they are only going to harm your skin. If you are still struggling in choosing a soap that will not only help you get rid of all the germs and dirt, but also make your skin healthy, there is a good news for you. Guess what? Miracle lavender rosemary anti-blemish soap will not only make your skin healthy but also help you in getting rid of blemishes. As a fact, a skin product containing neem can never be underestimated. It is a one solution to battle all skin problems. The Neem tree is an evergreen tree and is often called the 'pharmacy of villages' just in praise of its medicinal properties. Be it an acne or a blemish or for that matter even chicken pox, Neem cures it all. Our soaps enriched with the goodness of Neem helps your skin become flawless and beautiful, day after day. Our soaps are free of Chemicals, Paraben, Sulphate, SLS and Silicon. We believe in using only natural oils and herbs.